A machine which changes mechanical energy to electrical energy is called Generator. 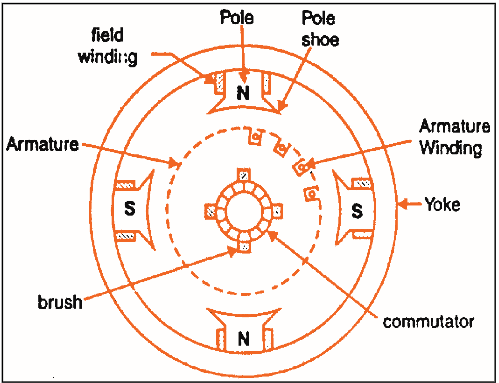 A D.C. generator has a coil winding for poles on the stationary part which gives a field stationary in space in the air-gap due to D.C. supply in the field winding around the pole. The rotor has commutator type winding with stationary brushes for connection to external circuit. Although the purpose of generator is to produce direct voltage but the voltage induced in an individual armature coil is an alternating voltage which must be rectified. 1. Yoke- It is the frame of the machine which provide mechanical support for the poles and acts as a protecting cover for the whole machine. It also carries magnetic flux produced by poles. 2. Pole cores and pole shoes- The field magnet consist of two parts i.e. pole cores and pole shoes. The purpose of pole shoes is to support the exciting coil and spread out the flux in the air gap which reduces the reluctance of the magnetic path. 3. Pole coil- It is also called field coil which consists of copper wire, are wound for current dimension. When current is passed through these coil, poles are electromagnetize which produces necessary flux. 4. Armature core- It covers the armature conductors and causes them to rotate and cut the magnetic flux of the field magnets. It also provides low reluctance path to the flux through the armature. Armature core is laminated to reduce eddy current loss. 5. Armature winding- These consists of conductors which are placed in armature slots with tough insulating material. 6. Commutator- The main function of commutator is to convert AC induced in the armature current to unidirectional current in the external load circuit. The segments of commutator are insulated from each other by thin layer of mica. The number of segment is equal to number of armature coil. 7. Brushes- Brushes are made up of carbon and graphite in the shape of rectangular block. It is used to collect current from commutator. DC generator is mainly divided into two type, i.e. seperately excited and self excited. Seperately Excited DC Generator- It is a type of generator in which field winding is excited from an independent external DC source. So, Ia = IL and V= Eg - IaRa. Power developed Pg = EgI and power delivered to external load PL = VI. 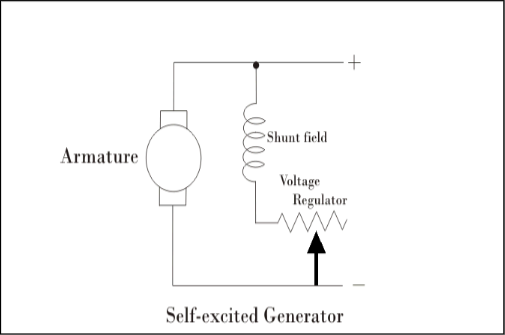 Self Excited DC Generator- It is a type of generator in which field winding is excited by the current supplied by the generator itself. Self excited generator is classified as series wound, shunt wound and compound wound generator. Series wound generator- It has only one field winding which is connected in series with armature winding so that whole current flows through the field winding as well as load.So, Ia = IL =Ise = I and V= Eg - I(Ra +Rse). Power develop = Pg = EgI and power delivered = PL = VI. Shunt wound generator- In shunt wound generator, field winding is connected across armature circuit forming a parallel or shunt circuit. So, Ia = IL +Ish and V= Eg - IaRa. Power developed Pg = EgI and power delivered PL = VIL.. Compound wound generator- It has two field winding. It has two possible connections i.e. short shunt in which shunt field winding is in parallel with armature and long shunt in which shunt field winding is in parallel with both armature and series field winding. Thus, armature current has two main component, one of demagnetising component and other of distorting component. 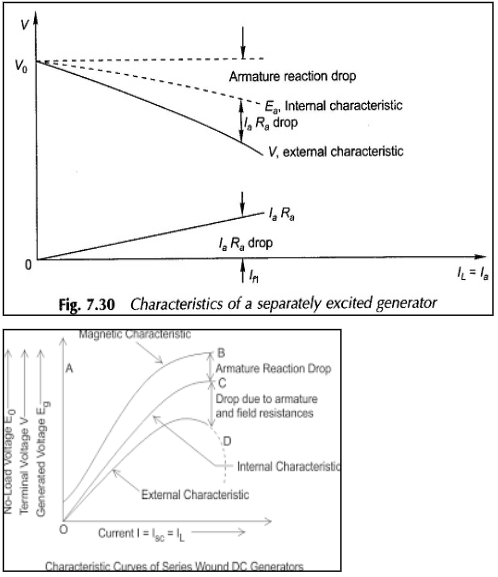 These two components increases with increase in armature reaction. Under severe overloads or short circuit, the demagnetising component may become so strong as to reverse the polarity of main pole. When the main flux is decreased due to armature reaction, the emf induced in the armature of a DC generator is also decrease because E is proportional to flux. Demagnetising effect is normalized by adding a few extra ampere-turns to main field winding and the distorting effect is neutralized by using compensating windings. These windings are embedded in slots in pole shoe and connected in series with armature in such a way that current in them flows in direction opposite to that of the armature conductors directly below the pole shoe. The flux of over half pole increases and over half pole decreases because of armature reaction. But the total flux is reduced slightly which in effect reduces the terminal voltage. The effect of reduction in the flux due to armature reaction is called demagnetising effect. It shifts the direction of neutral magnetic axis with the resultant flux which distorts the flux. It also causes commutation problem. DC generator generates current which is induced in armature conductors, is alternating in nature. So, we need a commutator to make the current flow unidirectional in the external circuit. Current flow in one direction when armature conductors are N-pole and in the opposite direction when they are under S-pole. When conductors pass out of the influence of a N-pole and enter that of S-pole, the current in them is reversed. The reversal of current takes place along magnetic neutral axis or brush axis. It short-circuits the coil when current is reversed. The process by which current in the short-circuited coil is reversed is called commutation. Resistance commutation- In this reactance voltage must be kept as low as possible. Reactance voltage can be minimized by small length of armature core, chorded armature coils and smallest number of armature turns per coil. If the voltage drop across the brush-contact resistance is sufficiently large as compared with the reactance voltage. Voltage commutation- As the flux density wave is shifted due to armature reaction. This produces the rotational EMF. To cancel the effect of rotational voltage, the flux density in the interpolar zone should be reduced to zero. It can be done by using interpoles. Thus, interpoles neutralises the armature cross flux and also produces some flux in the interpolar zone. DC generator has two types of curves 1. Magnetisation characteristics 2. Load characteristics. Magnetisation characteristics- It is plotted between generated no load voltage versus field current when speed of generator is kept constant. When it is plotted without load keeping output terminals open, it is called no load characteristics. External characteristics- It is plotted between terminal voltage and load current. 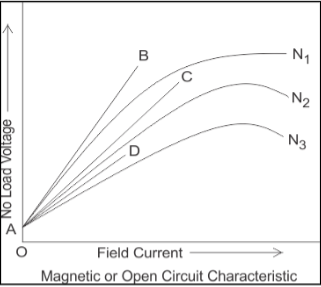 Internal characteristics- It is plotted between generated induced EMF and armature current. Ex 1: A shunt generator of terminal voltage 220V delivers a current of 250A to the load. The shunt field and armature resistance are 50W and 0.02W respectively. Calculated generated voltage. Ex 2: A shunt generator gives full load output of 30kW at a terminal voltage of 200V. The armature and the shunt field resistance are 0.05 ohm and 50 ohm respectively. The iron losses are 1000W. Calculate (i)emf generated (ii) copper losses (iii) efficiency.